Welcome to part two of my wanderings around Stoke Newington. During part one, I headed up and down the high street in search of interesting typography and wasn't disappointed. 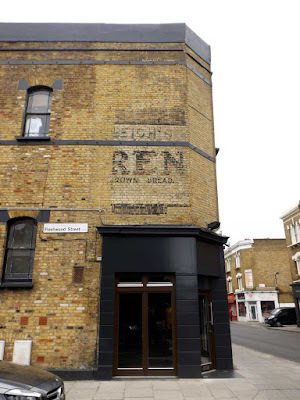 After a quick trip to the pub, I set out for Church Street, a road renowned as the epicentre of ghost sign activity in Stokey. It wasn't long before I spotted my first sign on the corner of Fleetwood Street. 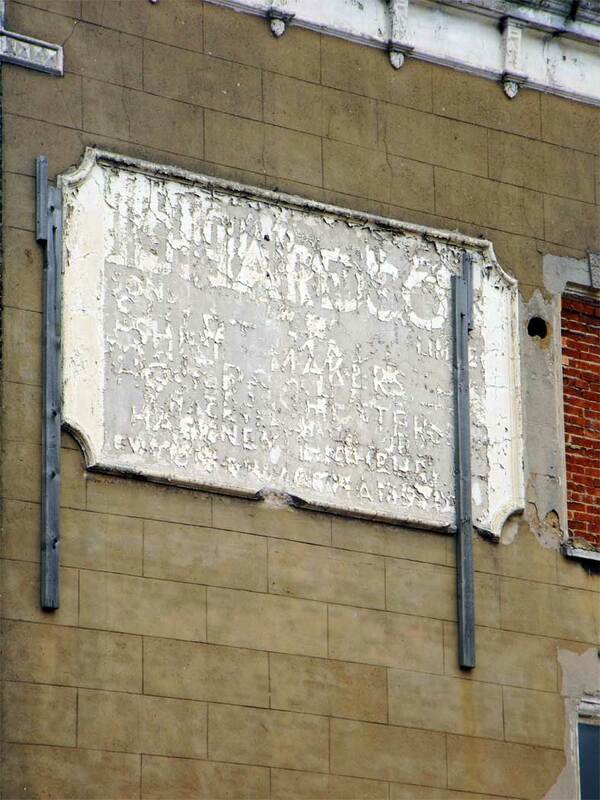 Revealed during the removal of a billboard, the full text once read 'Hurstleigh's Bakery, Daren, Brown Bread. According to Spitalfields Life, Daren was the name of a flour mill based on the banks of the river Darent in Kent. What little is visible of the type looks impressive, all slab serifs and chunky drop shadows - a real sign writers dream. It's a shame there doesn't seem to be a record of the whole thing! Over the road on the corner of Lancell Street I spied a long, thin ghost sign on a chamfered corner wall. Though almost unreadable, it didn't stop me staring for five minutes trying to decipher it. The only words I can guess are 'Agents for' about half way down but sadly the rest remains a mystery. Heading further up Church street, I stumbled across what are possibly the most famous set of ghost signs in London. The first was this striking palimpsest advertising no less than three products: Gillette Razors, the Westminster Gazette and Criterion Matches. 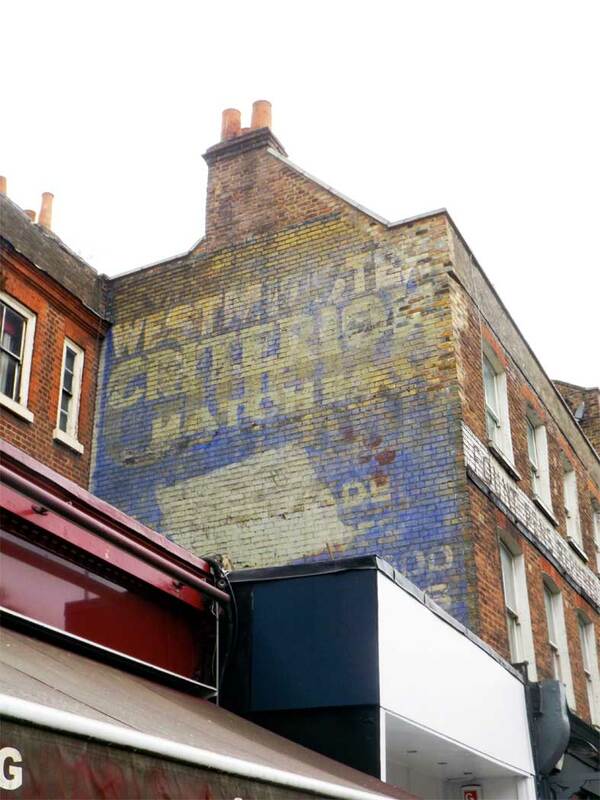 Along with Hovis (they of bread fame) Gillette were one of the first brands to fully realise the potential of painted adverts as a promotional medium and as such many examples of their signs can be found around London, painted in characteristic white and yellow on a bright blue background. At some point, the other two companies must have bought the rights to use the space and painted over the older signs. Time though, the great leveller, has seen fit to even them all out and the result is a spectacular collection of lettering styles, each marking different layers of history. Fantastic! On the front of the same building I came across what is quite possibly London's most famous (and certainly one of its most charming) ghost signs. 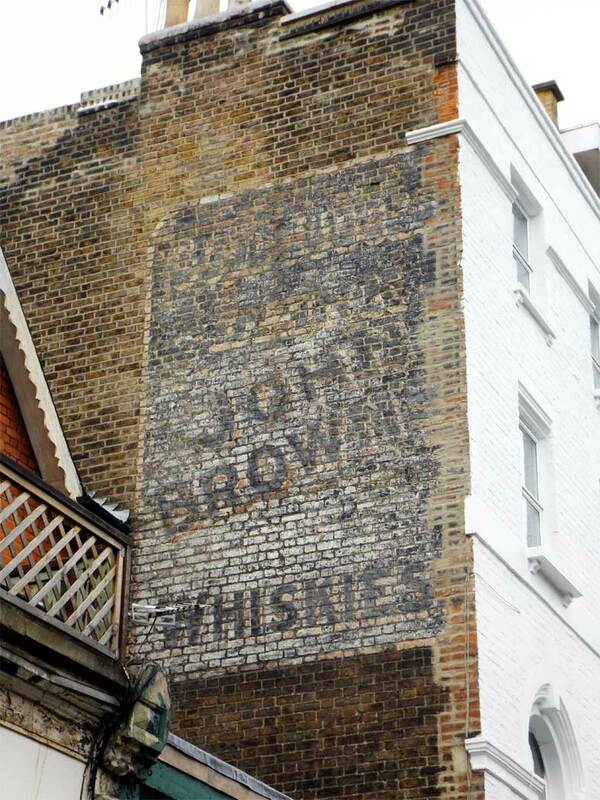 This is the sign that originally inspired the founder of GhostSigns, Sam Roberts, to start documenting these old adverts all the way back in 2006. Anyway, back to the sign itself. The former occupants of the building appear to have been a company called Walker Bros, who specialised in the repair of fountain pens, particularly those of Watermans, a company who are still in the pen-making business today. 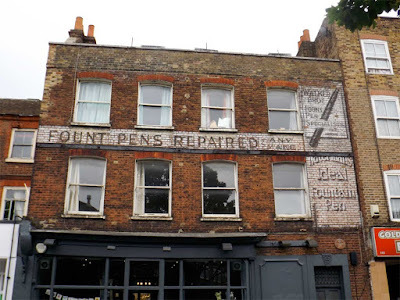 In today's technological world it's difficult to imagine a time when you'd actually take your fountain pen to a shop to be repaired but evidently many people did. The sign has got huge amounts of character, being painted in a shape that aims to make the best use of the available space. The long thin panel looks to have been repainted at some point, as behind the slightly crude looking 'Fount Pens Repaired' lettering it is possible to make out hints of some chunky, serifed lettering that has more in common with the rest of the sign. The Watermans panel features a lovely lock up of title case lettering, in what looks like a flared serif style with a heavy drop shadow. The arched Watermans type is a nice touch too. Above this, the Walker Bros panel is inset on a beautifully drawn piece of notepaper with a fountain pen laid across for good measure. What more you you ask for? 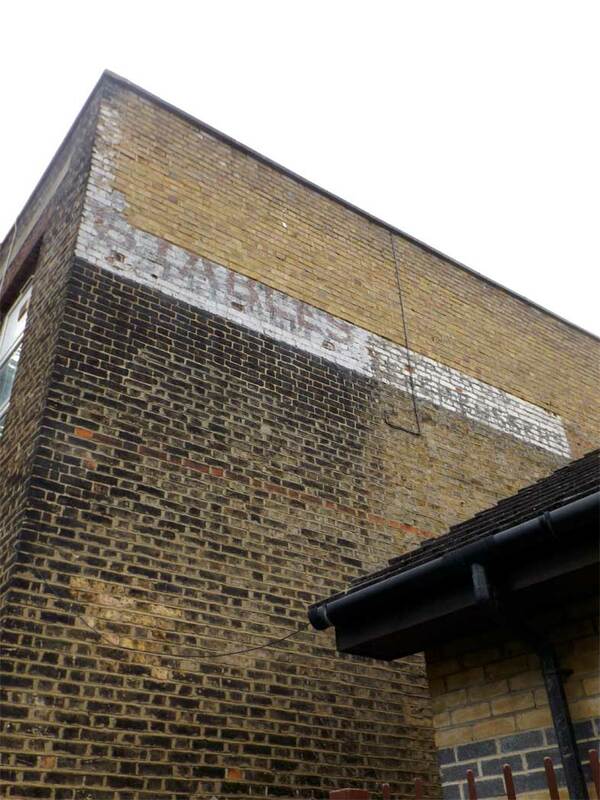 Further up Church Street a blink-and-you'll-miss-it ghost sign clings on above Hazel Alterations on Marton Road. 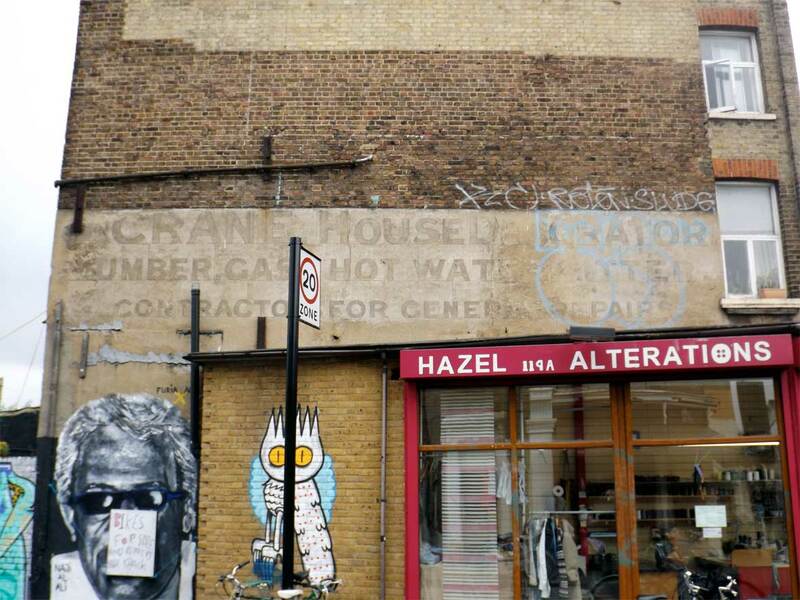 Though heavily faded and encircled by graffiti, it clearly advertises the services of Crane House Decorator in solid grotesque lettering. 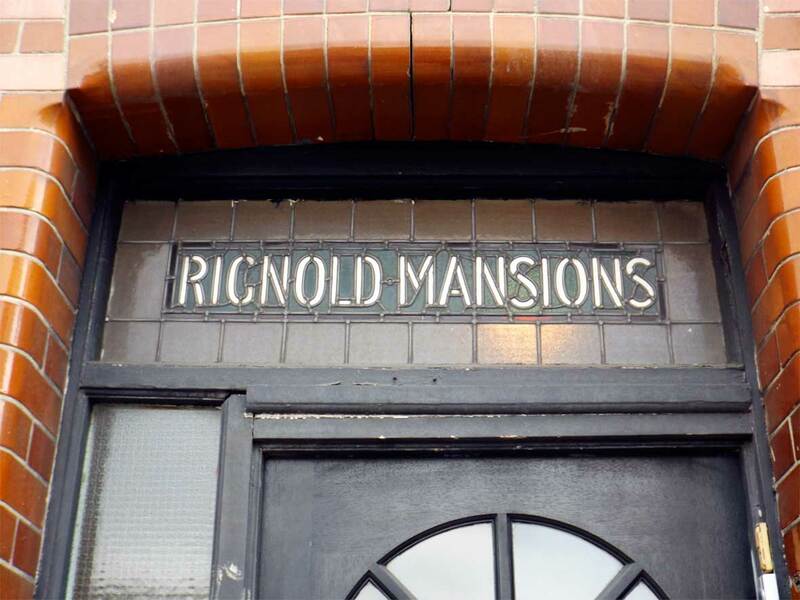 After being spoiled by all the ghost signs I almost missed this nearby stained glass fanlight above the entrance to Rignold Mansions. It's always nice to see lettering incorporated into stained glass, especially when it takes on a stencil effect like it has here. Could this be the work of our old friends Cakebread, Robey & Co, Stoke Newington's favourite local stained glass suppliers? I'd like to think so. Walking back down Church Street I managed to resist the temptations of the Daniel Defoe pub, but couldn't resist snapping its former name, The Clarence Tavern, carved into the top of the building in an engraver's Gothic style of lettering. According to History of Stokey, the Clarence Tavern was built in 1860 and is the oldest pub building on Church Street. Over the years it has undergone numerous name changes including The Salmon and Trout and Steptoes. 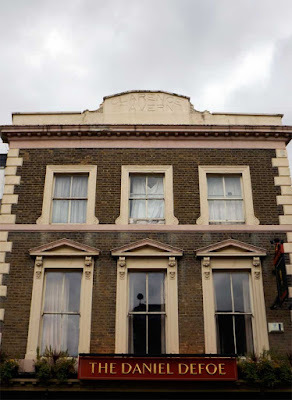 It was finally renamed the Daniel Defoe in 1999, in honour of the author who once lived nearby. Further on I spotted another sign that had eluded me on the way up, this time belonging to A Rubenstein & Sons, aka 'Alf the Purse King', a purveyor of purses, pouches, handbags and wallets. By all accounts a charismatic fellow, Alf can be seen in his prime here courtesy of History of Stokey. Painted in a combination of black, white and red, this sign would have been quite striking its day. Unfortunately you have to look closely to read the type now, but what can be seen looks to be a mixture of condensed and regular sans serif lettering styles. Alf the Purse King may be long gone but his spirit certainly lives on in Church Street. 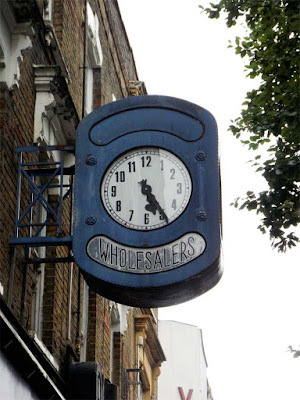 Back in the direction of the station, on the corner of Cazenove Road a large furniture store occupies what was once a pub known as the Weavers Arms. 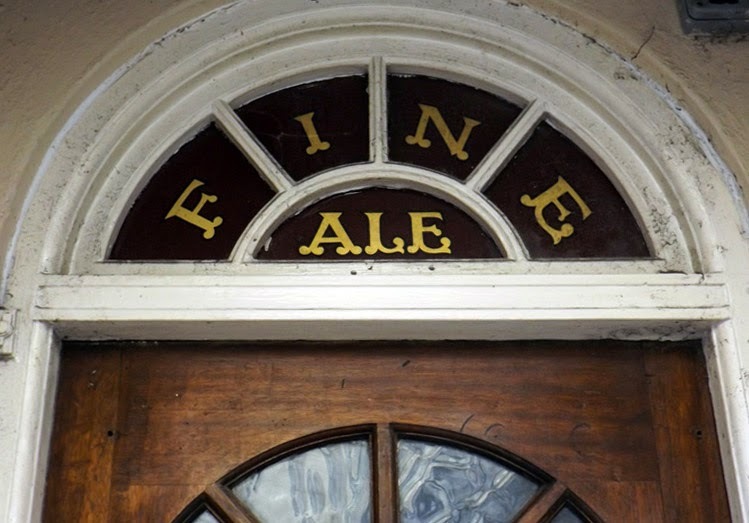 The only clue to the pubs existence is some rather neglected lettering carved into the top of the facade of the building's side. I've not been able to find out too much about the Weavers, other than that it looks to have been opened sometime in the mid-19th century. Some rather fantastic views of the pub in it's glory days can be seen here and here, again courtesy of History of Stokey. On the opposite side of Cazenove Road a fading shopfront caught my eye. Madame Lillie's was a once a corsetiere's shop, though very little information about it can be found online. The building was most recently home to an art gallery, though at the time of my visit it looked to be empty once again. The faded sans serif lettering of the sign is in an advanced state of disrepair, though deep drop shadows are still visible on the individual characters. 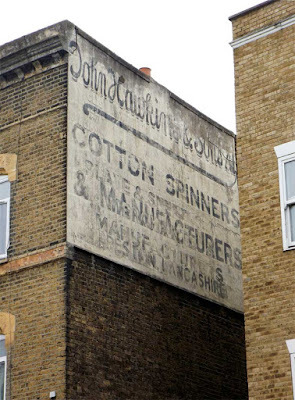 Looking back down Cazenove road presented yet another ghost sign (see what I mean about Stoke Newington?) Bearing the just about readable legend 'Good judges drink John Brown Whiskies', the advert has suffered plenty of fading but hints of blue, white and red can still be made out. The lettering has been painted in a mixture of flowing script (think the old Wall's ice cream logo) and a blocky grotesque style. The only thing missing is a nice hand painted whisky bottle! As an interesting footnote, this sign was recently under threat from the owner of the building but thankfully our old friend Sam Roberts stepped in to save the day. Read all about his adventure here! 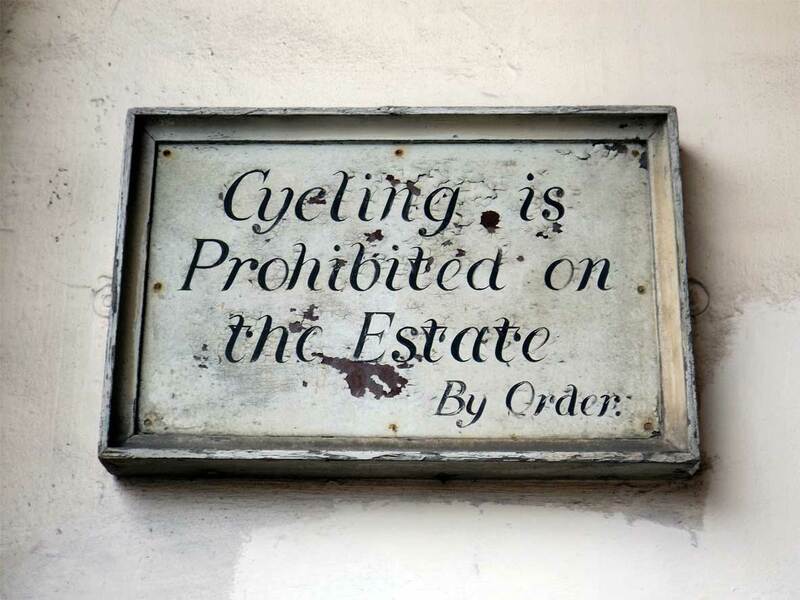 Just when I thought Cazenove Road had given up all of its secrets I found one more sign hiding in a shady corner. 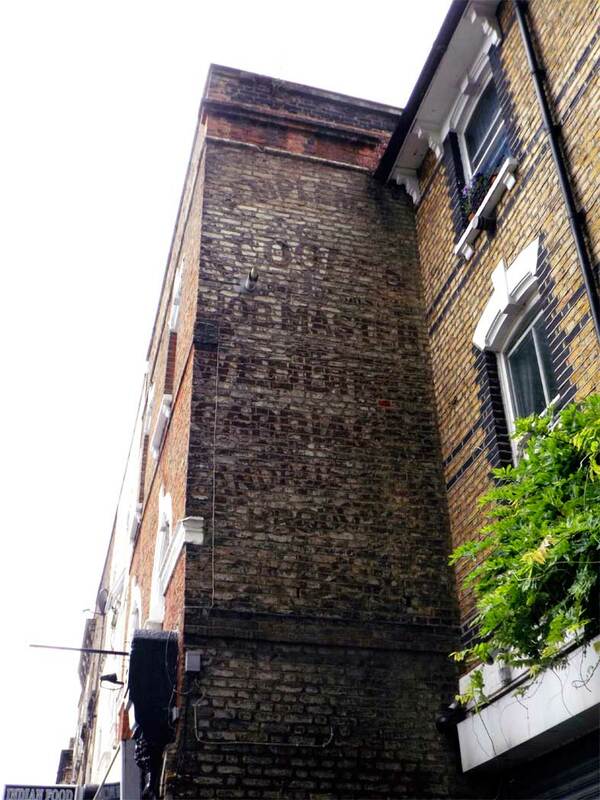 Although difficult to make out in the above image, the sign reads 'F.Cooper, Job Master for Wedding Carriages, Broughams, Landaus, Cabs'. 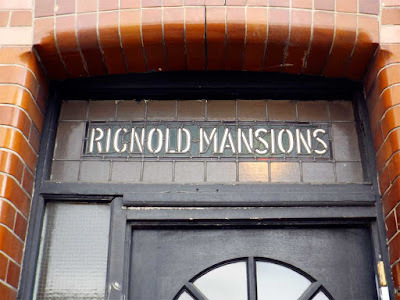 The lettering looks to have been painted in a fairly standard grotesque style, however the use of key lines holding the word 'and' as well as arched and angled text forms a varied and eye catching layout. Last but not least, I headed off Cazenove Road in the direction of the station. Although it had already been a more fruitful day than I could have imagined, Stokey provided one last ghost sign to add to my list. Despite only a strip remaining, it is possible to make out the words '6 tables' and 'embossers', as well as some hints of an older sign that has been painted over. Not the most spectacular sign of the day, but definitely one worth documenting. So with that I jumped back on the Overground and headed home. 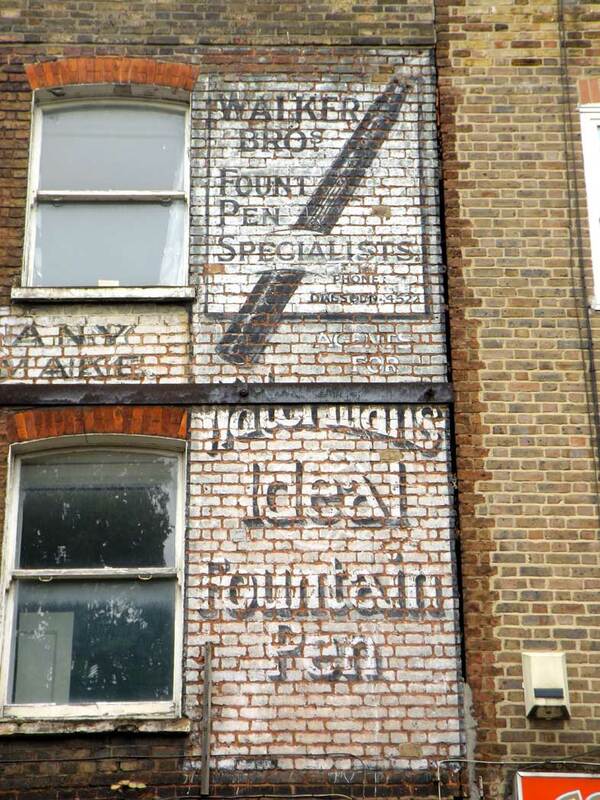 As I've hopefully shown from these photos, Stoke Newington is one of the best places you can go if you're looking for ghost signs. Moreover, as an authentic taste of the old East End, it really does take some beating. See you next time Stokey! Stoke Newington or 'Stokey' to the locals is a district in the London Borough of Hackney. The area has been settled since medieval times, when it was a small village a few miles from London used mainly as a stop for travellers heading north. Nowadays it is well and truly a part of the city, though it is renowned for retaining some of its village character with a large array of open spaces and a bustling town centre. Over the last century Stokey has seen its fair share of action, from being heavily bombed during World War Two through to significant urban regeneration in the last twenty years. Nowadays it plays home to a diverse and vibrant community as well as some of the most famous ghost signs in London. With the latter in mind, I headed over on a grey Saturday morning with my camera at the ready. After arriving at Stoke Newington overground station I headed left and up the high street. It wasn't long before the first find of the day presented itself, a peeling ghost sign tucked away on the side of a light industrial building. 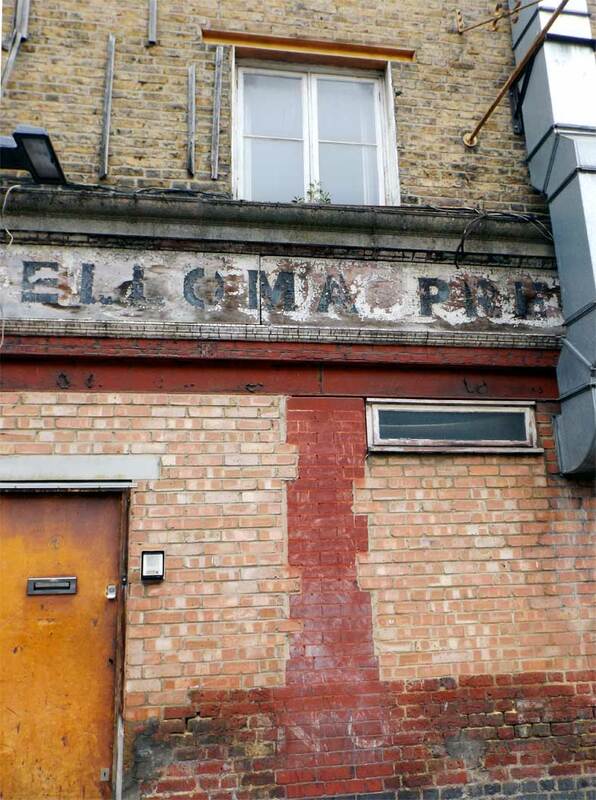 As the sign says, this was the former home of Elloma Preparations Limited, who according to Companies House were a firm active from 1947 until 1996. Exactly what they were preparing remains a mystery. Due to its length it was difficult to fit the sign into one shot, at least for an amateur like me. From what i've managed to capture the lettering looks to have been painted in a bold grotesque typeface, though most of the details have suffered significant fading over the years. 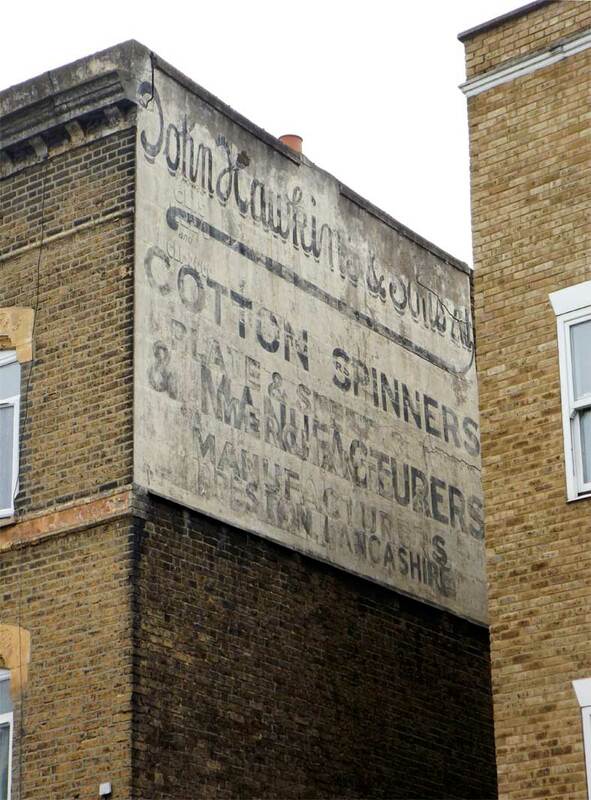 Continuing up the high street it quickly became apparent why the area is so renowned by ghost sign hunters with the appearance of a lovely example for John Hawkin & Sons, a Lancashire cotton spinning firm. 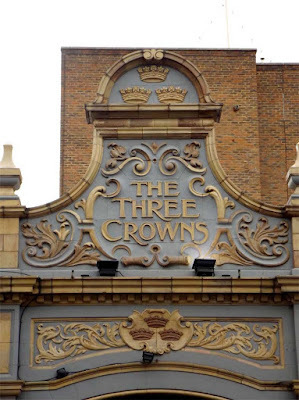 The company had quite a few locations in London and if you want to know more about them, I highly recommend the London Road Croydon blog's excellent article here. The type is a mixture of a playful, upright script with a very lovely ampersand and some clean sans-serif faces for good measure. 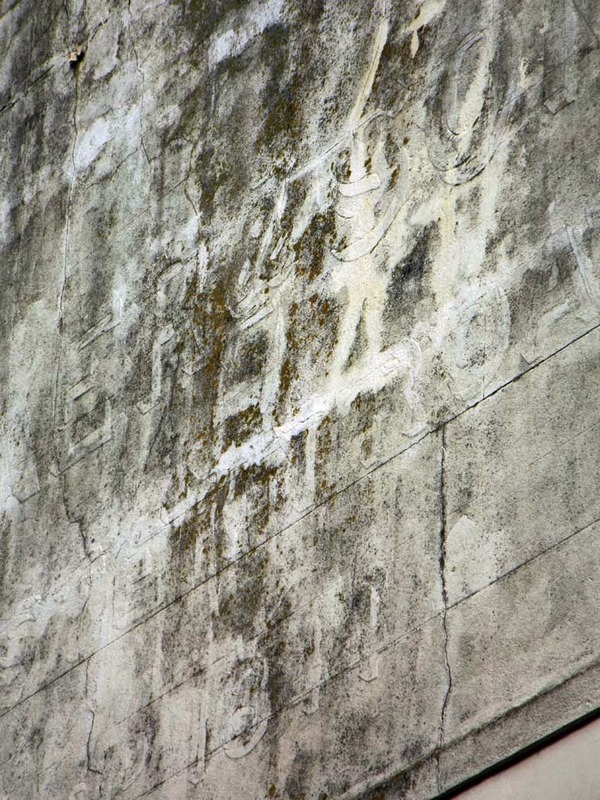 Most of it is still readable and you can just make out the remnants of an earlier sign coming through here and there. 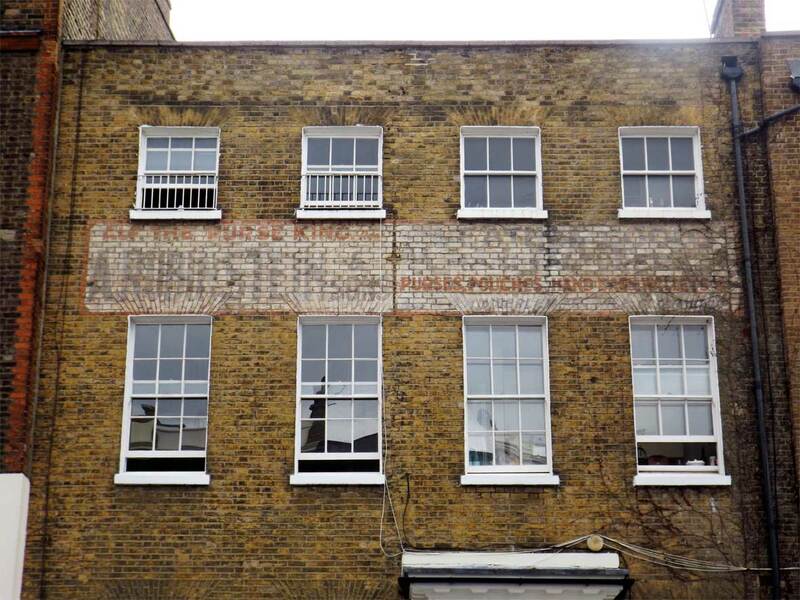 On the other side of the street, a building on the corner of Tyssen Road features an enormous sign belonging to the firm of Cakebread Robey & Co, providers of a rather extensive range of hardware services. Famed for their stained glass in particular, numerous examples of the company's work can reportedly still be found in pubs and churches around the South East. 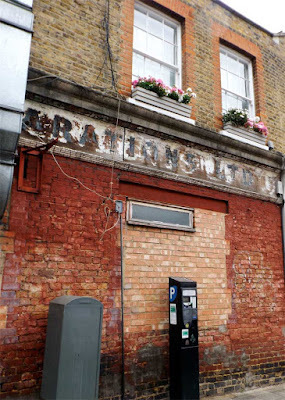 A striking combination of white and red, the sign itself is an example of a palimpsest, a term which in this case means a sign painted on top of an older one. The lettering isn't especially decorative but the overall layout and the use of different sized panels gives it plenty of character. Anyway, who needs fancy serifs and swashes when you've got a massive bleedin' wall? Further up the high street this rather striking blue clock hangs on above the pavement, a remnant from a time when advertising your business with a giant public timepiece was the done thing. Sadly, the name of the firm responsible has disappeared, leaving us with only the word 'wholesalers' and a clock face frozen at twenty-five past five. The lettering is a light condensed sans serif with a touch of art deco style, arranged on a curve. If you half close your eyes, the whole thing looks a bit like a cyclops sporting a big toothy grin. Or maybe it's just past my bedtime. 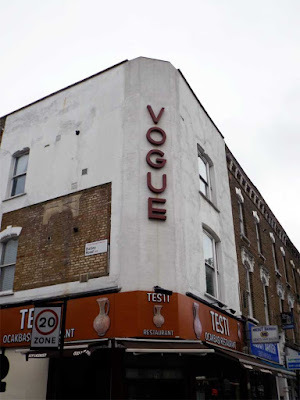 Next up is the former home of the Vogue cinema, which still retains its original 1940's signage on a chamfered wall. According to Cinema Treasures excellent article, the venue opened as the Majestic in 1920 before being renamed Vogue in the forties. In 1958 it was closed, and lay derelict for 42 years before being refurbished as a restaurant and flats at the turn of the millennium. 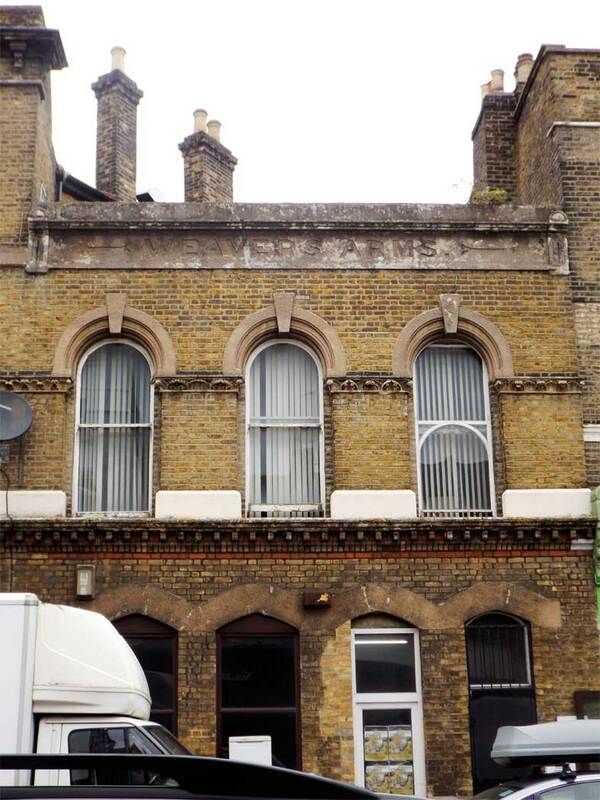 During this period of disuse it was thought to be the longest closed cinema building in London. I can only imagine how exciting it would have been to get inside and photograph it during this time. The lettering is in a stylish sans serif that is similar to Futura, judging by the very specific G. However, the lower crossbar on the E suggest that it may have had some customisation. Either way it's a great piece of history and kudos is due to the owner for preserving it. After crossing the road and starting to head back this charming hand-painted sign caught my eye. The delicate italic lettering features high contrast thicks and thins as well as flowing, soft serifs that enhance the polite authority of the message. If I'd had my bike with me, I would have been walking by now. 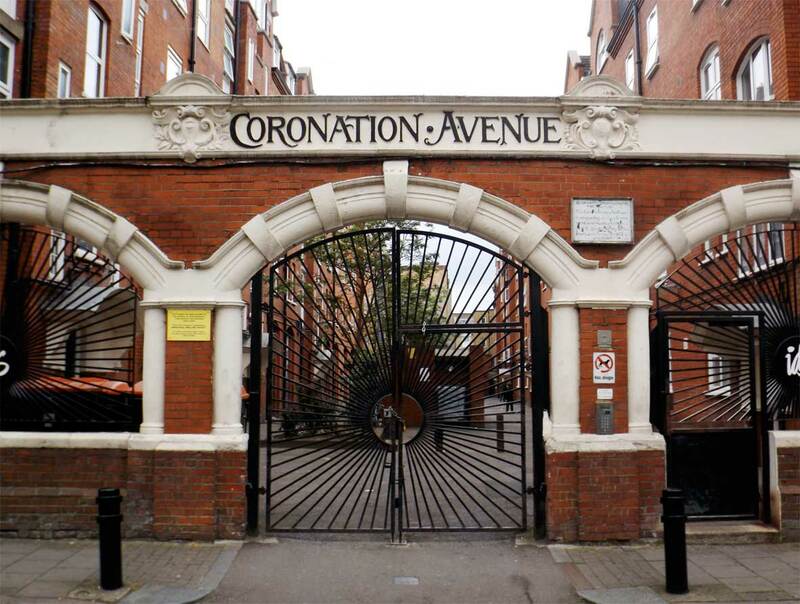 On nearby Victorian Road I came upon the grand gateway to Coronation Avenue, crowned with some fantastic ornamental lettering. Featuring a flamboyant kick descending from the uppercase A and extended serifs on the N's, this is a typically Victorian style and one that I never tire of. Although a peaceful looking gated community today, Coronation Avenue has known its share of tragedy, being directly hit by a bomb in World War Two that killed as many as 170 people. A harrowing first hand account of that fateful night can be found here, and serves as a stark reminder of dark times in the not too distant past. Continuing back down the high street, I spied this almost unreadable ghost sign high on the side of a building. Painted in a purpose built decorative panel, there's not much that can be said about the type but according to the Spitalfields Life's excellent article, it is an advert for Richardson & Sons Shirtmakers of Hackney, Leyton and Walthamstow, painted around 1955. Nearby, the Rochester Castle pub provided the first mosaic of the day. The colour scheme of brown and gold is a good match for the fittings of the pub and the lightly serifed type has some great decorative touches including a double crossbar on the A and extended tails on the R's. According to owners J D Wetherspoon, the pub itself was built in 1801 by Richard Payne, who was originally from Rochester. Prior to that, the site was home to another inn called the Green Dragon which had occupied the space since at least 1702. 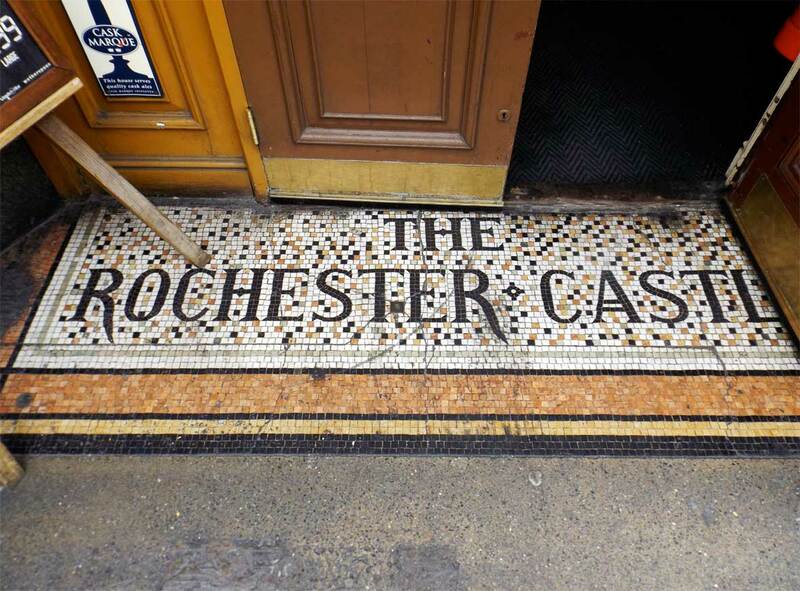 The Rochester is also noteworthy for being the longest held premises in the company's portfolio, being purchased by the chain as far back as 1983. 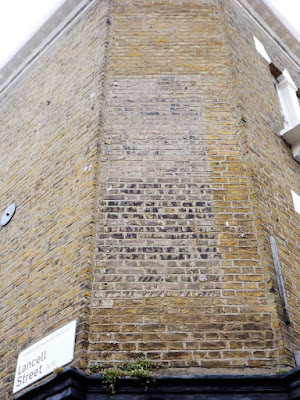 Across the road, a Georgian style building set back from the street features a very faint ghost sign for the original owners: none other than Marks & Spencer, the famous department store. Now home to a branch of Sports Direct, the fortunes of this building seem to have declined slightly since its construction in the 1930's, however its well preserved exterior lends a touch of faded glamour to the street. 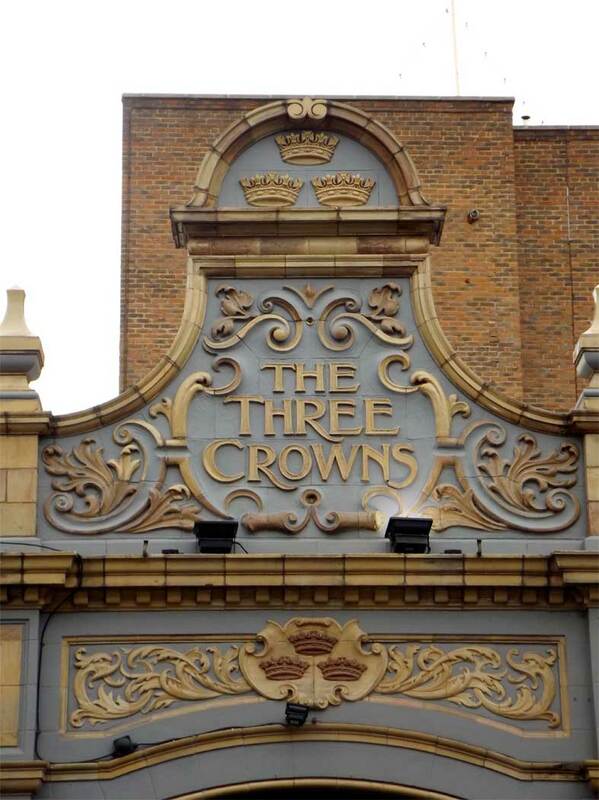 As it was getting on for lunchtime the Three Crowns pub was next to catch my eye with its beautifully elaborate side entrance, painted in an regal combination of blue and gold. 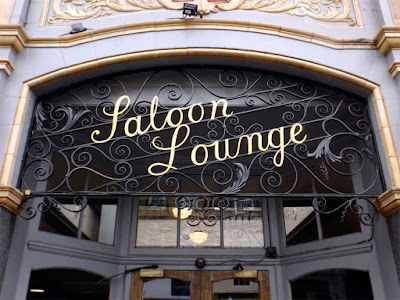 The decorative carving features the pub name written in some tightly spaced lettering that's not too flashy, but boasts elegant flared serifs and a satisfying curved crossbar on the N.
The side entrance is also home to some fantastic ironwork featuring the words 'Saloon Lounge' picked out in a neat gold script. I love the way the type and ornaments intertwine here and the angled lines are a great touch. The only thing that lets it down is the dodgy kerning between the L and the O that you could drive a truck through. My inner designer screams in terror, while the realist in me reckons that I ought to get out more. At this point I nipped through this wonderful doorway and into the pub, so it seems like a good place to finish part one. If you made it this far, thanks for reading and look out for part two coming next week. Cheers! In the first part of our walk around Brighton we explored the North Laine area which proved to be a treasure trove of great typography. You can check out the original post here. After stopping for a quick pint and something to eat we headed towards Kemptown to continue the day's exploration. On the way up St James street we passed a tall, rounded building featuring raised sans serif lettering that reads "Kemp Town Brewery Entire". According to the Brewery History website this was a pub rather than a brewery, known at the St James Tavern and owned by Kemp Town Breweries Ltd who became part of Charringtons in 1963. 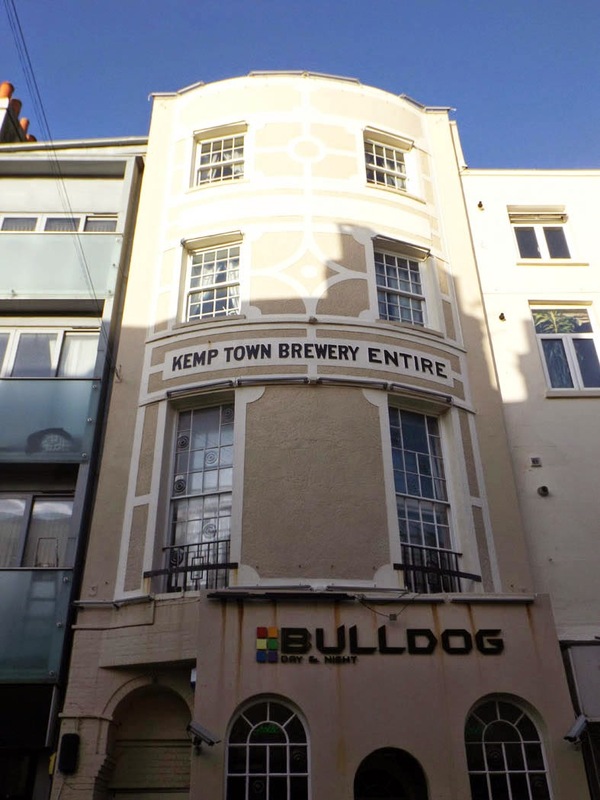 Although it's unclear when the pub closed, the building has been the home to Brighton's oldest gay venue, The Bulldog, since 1979. Above the domestic looking doorway of the Bulldog another trace of the former St James Tavern can be seen in this decorative lettering on the fanlight glass. The rounded terminals and sharp serifs of the type have some circus poster influence, feeling friendly and inviting. I can only hope that the Bulldog continue to fulfil the promise of fine ale inside. After continuing up St James Street we arrived in Kemptown, a mostly residential part of town that just happens to have a great selection of old pubs, a microbrewery and more antique shops than you could shake a jewel-encrusted cane at. On the corner of Upper St James street a tall, grey building features some raised lettering above a doorway in a condensed sans font. According to Wikipedia St John the Baptist's school was located here from 1850 to 1989 and like many schools of it's time featured separate entrances for boys and girls. 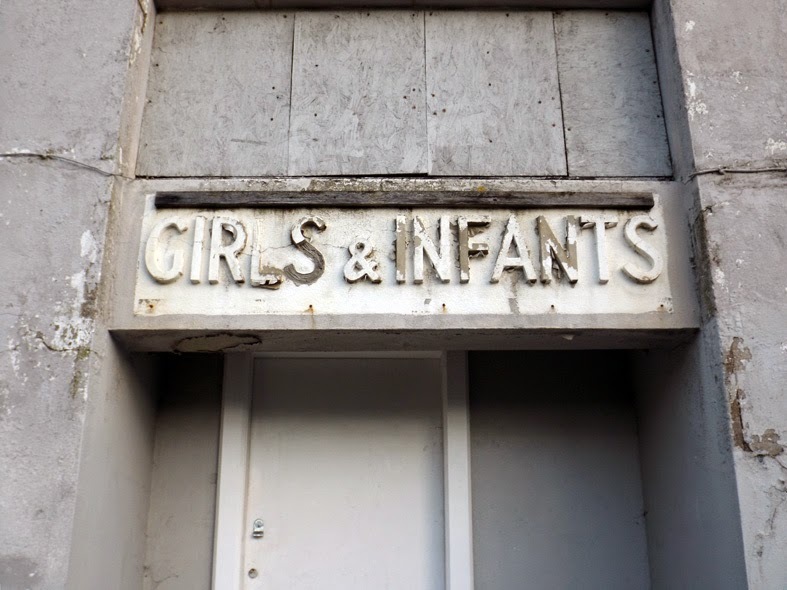 The building is now rather empty looking, with the girls entrance lettering remaining as the only sign of its former use. 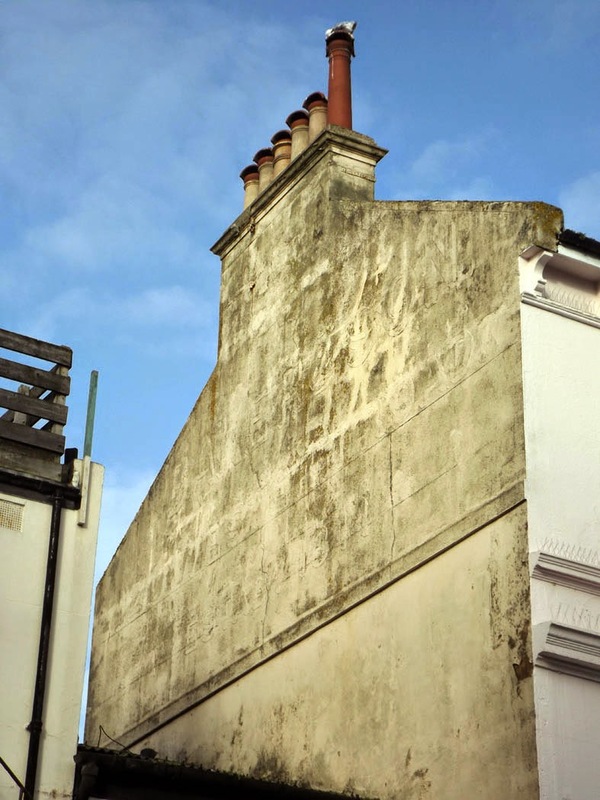 After a few hours in Kemptown we retraced our steps back into town toward The Lanes, a historic maze of narrow alleyways that was once the heart of Brighton's old fishing town. 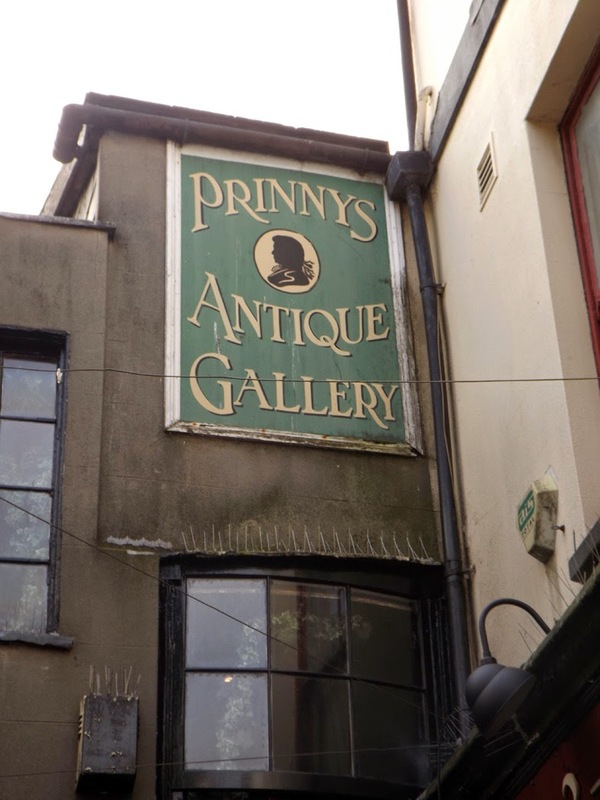 Although now home to a a mix of antique, jewellery and designer shops, The Lanes retain loads of authentic character and is a must-see when visiting the city. 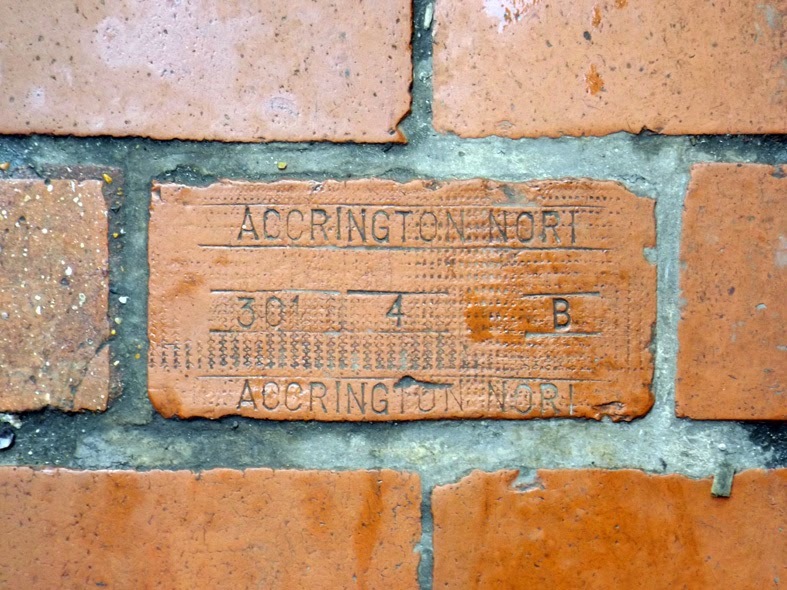 Naturally, I was too busy looking at the floor to notice the shops and couldn't resist stopping to snap part of the walkway that featured a brick with the original makers mark of Accrington Nori, a well known Lancashire brick works that is still in operation today. Famed for their strength, Nori's bricks were used in the construction of landmarks such as the Empire State Building and the Blackpool Tower. According to legend, the name 'Nori' came from an unintentional backwards spelling of the word iron. 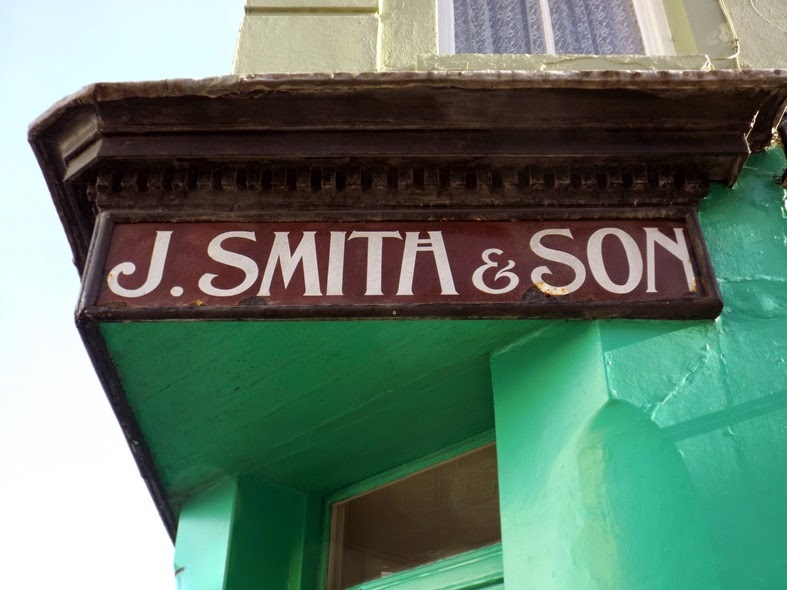 Although there's not a lot to say about the type here, I thought this was an unusual piece of history and a great find tucked away in one of Brighton's oldest streets. Heading back along Western road later in the day we passed the doorway to no.26 which features some eye catching script type. 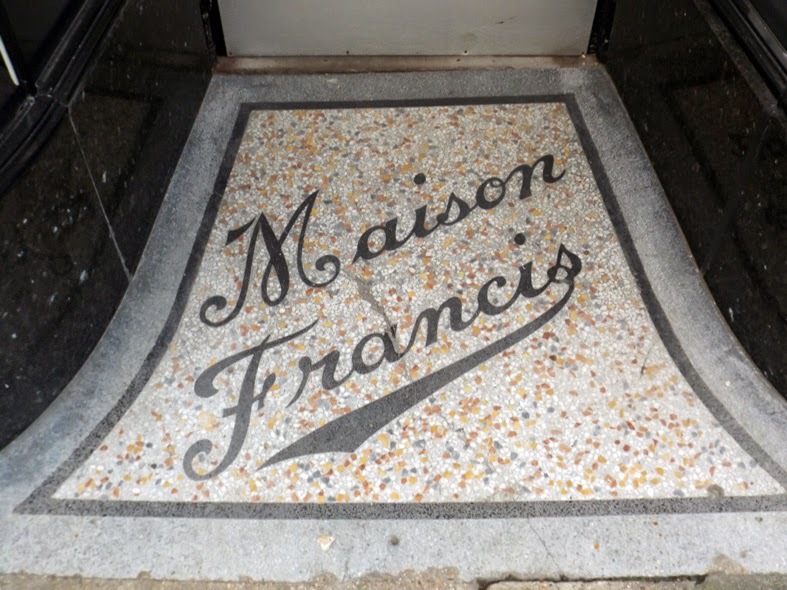 According to the My Brighton and Hove group Maison Francis was a ladies hairdresser first listed in the Kelly's directory of 1948, though it may have been trading much earlier than this. The script letter forms are beautifully drawn, especially the uppercase M with its loops and curls and the F with its extended swash. The dynamic, baseball-style underline extending from the lowercase S finishes the whole thing off with a bit of flair. 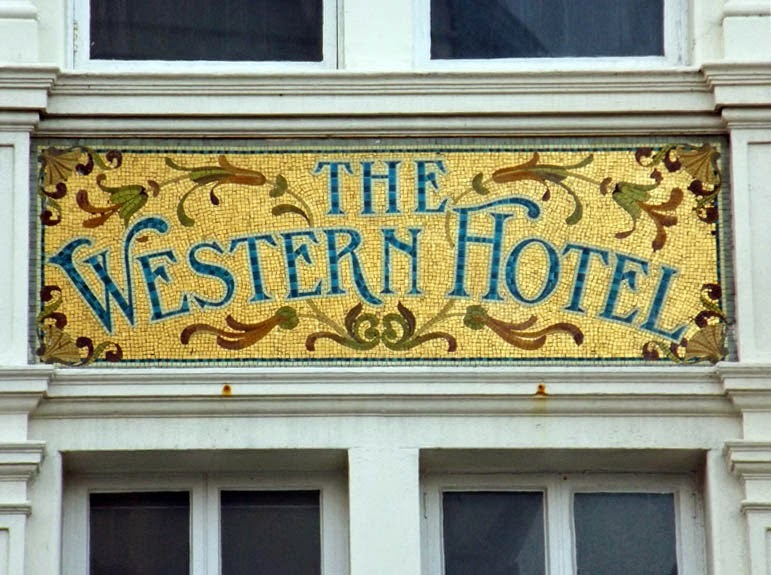 Above the Paris House pub at 21 Western Road an ornate mosaic for the old Western Hotel survives in remarkably good condition. The pub here has had many names over the years and according to Portslade History's excellent article it was known as the Western Hotel from 1854 to sometime in the 1920's. The mosaic itself is a stunning piece of work with a still-vibrant colour palette of gold, blue, brown and green. The type is full of flamboyant 19th century style, big swashes on the capitals, decorative cross bars and ornamental serifs abound. I'm a sucker for type on a curve and I think it works well here, giving room for the ornamental elements to fill out the rest of the space in a suitably swirly fashion. 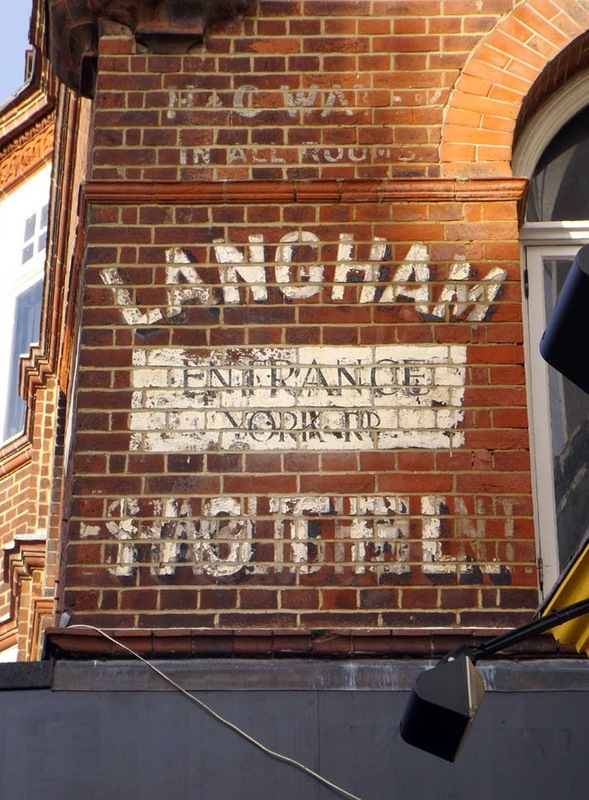 On the other side of Western Road, right on the boundary between Brighton and Hove, a painted sign for the Langham Hotel can be found on the side of an elegant red brick building. I've not been able to find out much about the Langham, though it does appear to still be in business. The sign helpfully tells us that it offers "H&C WATER IN ALL ROOMS", which is always handy. Though heavily worn the sign is still legible and features some chunky arched sans serif type with a heavy black drop shadow for good measure. Looking closely it seems that the word "HOTEL" was painted over another word at some point, though it's difficult to make out exactly what this says. On a street just off Western Road the faint outline of letter forms can just about be made out in the dirty whitewash on the side of this residential building. Looking closely, I can just about read "ER & SONS" in a bold sans font but it's difficult to manage anything beyond that. 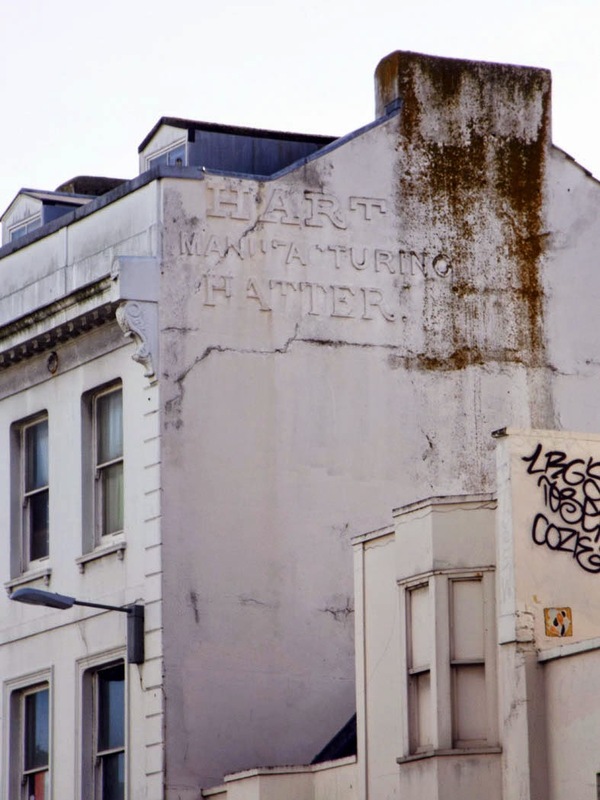 It's a shame to see another example of a painted sign that's been covered over, especially as it looks to have been a large one with a quite a few lines of type. 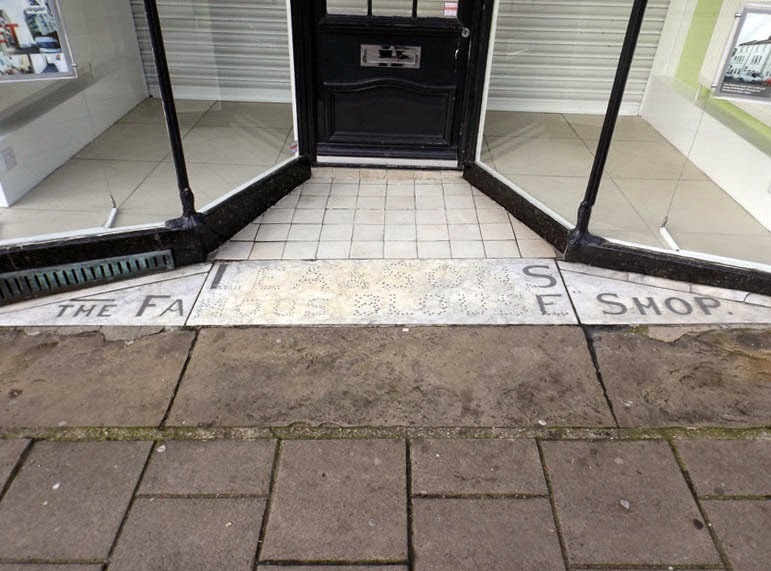 The final find of the day was this typographic marble flooring for Lea & Sons Famous Blouse Shop, tucked away just off Western Road on Preston Street. 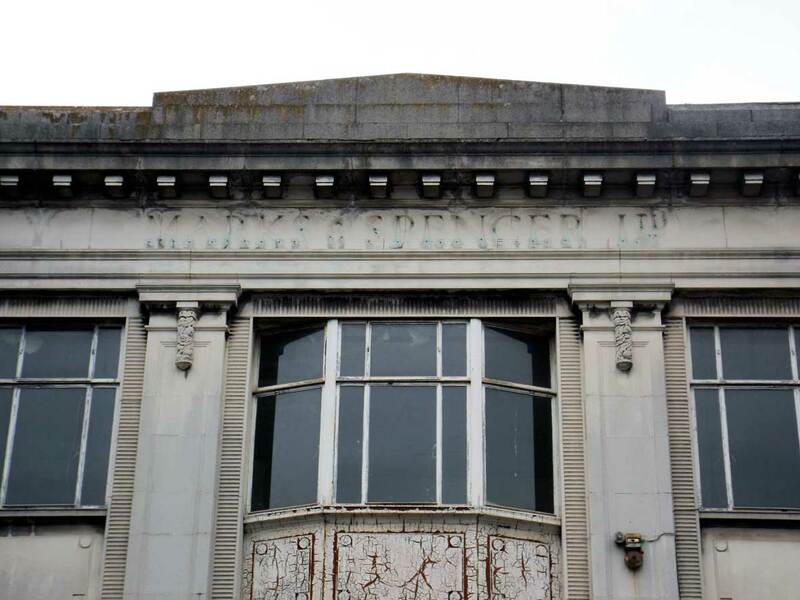 According to the excellent Through the Eyes of a Brighton Girl website, Lea & Sons opened here in 1914, selling blouses and hats before later becoming a drapers and closing for good in the 1950's. The elegant shopfront looks a bit empty these days, though it's easy to imagine it being quite sophisticated in it's time. 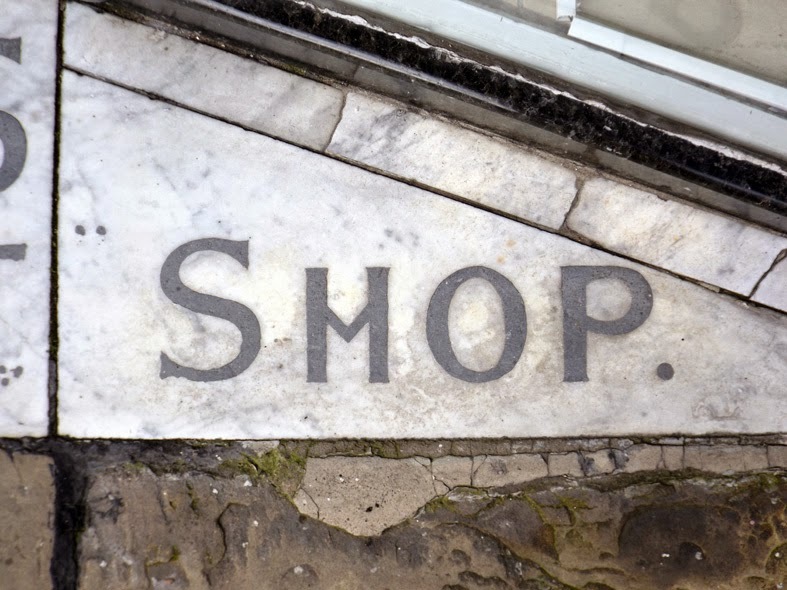 It seems that someone has tried to cover the central panel of the decorative floor though fortunately the letter forms are still easily legible. A closer look at some of the characters reveals some quirky features such as the v-shaped crossbars on the H and A, and in the photo below some slight serifs can be seen on the uppercase S. All in all a classy composition that's just begging to be restored to its former glory. As we headed back to the hotel I was left with an overall impression of Brighton as a city that has embraced it's heritage, injecting fresh life into its historical areas and enabling them to be appreciated by new generations. 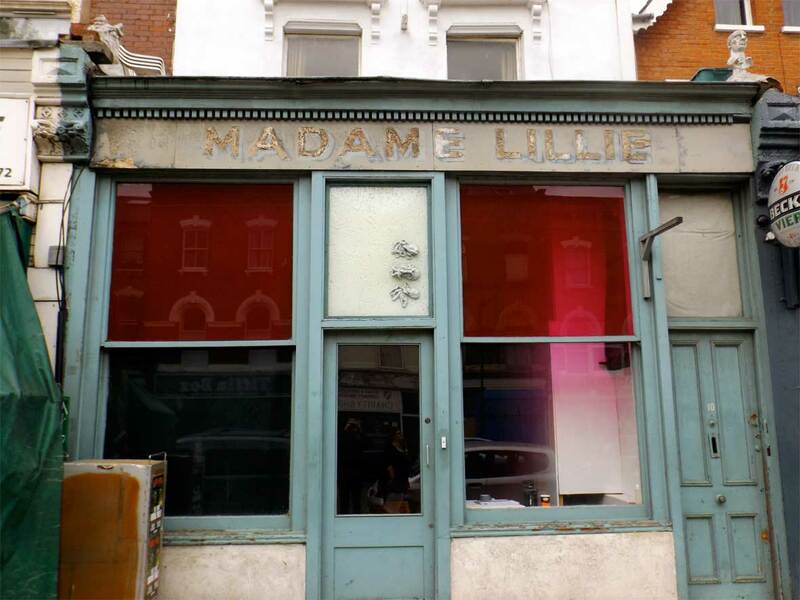 This can be seen in the preservation of the North Laine area (see part one), the thriving markets of The Lanes and the fantastic range of characterful pubs, many of which proudly retain their original interior fixtures. 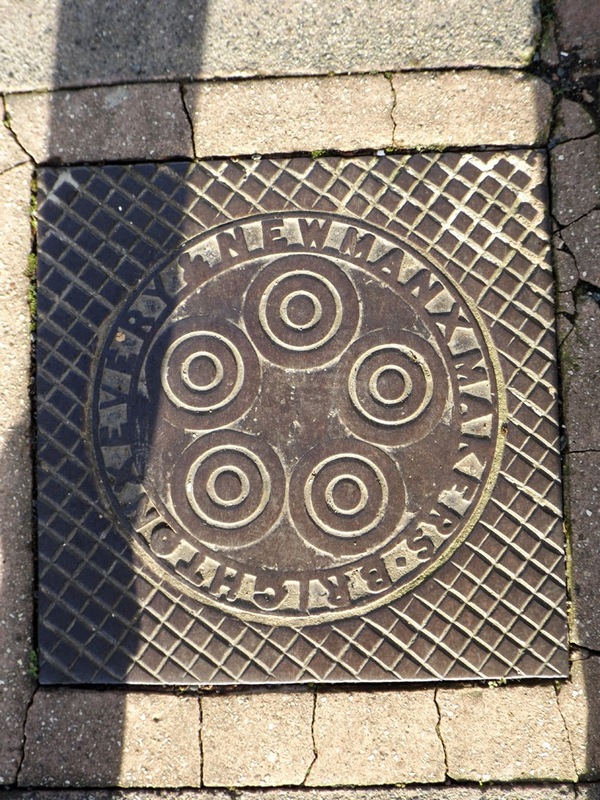 Instead of being ripped up or covered over, many subtle traces of the past are waiting to be discovered in doorways, high on the side of buildings and on the pavement underfoot. The feeling that I've only scratched the surface of these was confirmed after spotting another handful of great examples when driving home the next morning. There's definitely unfinished business for me here and next time I might even make it as far as the beach. Once again thanks are reading Urbantyping and feel free to add comments or criticisms below. Cheers! Earlier in the year we headed down to Brighton for a weekend by the sea. As it happened we spent more time getting lost in the maze of streets around the city centre than on the beach, but the amount of great type on offer (not to mention the pubs, markets and galleries) made the diversion worthwhile. After parking in Regency Mews and walking up Preston Street the first find of the day presented itself. Located in a shop doorway, these earthy coloured tiles feature little hints of a decorative typeface that's almost completely faded away. Heading into town presented an opportunity to test the zoom lens after spotting some raised lettering high on the side of a North Street building. According to Photo History Sussex, Hart Manufacturing Hatter was founded in the 1850's, meaning the type itself could be over 150 years old. Pretty good going considering its exposed location. The lettering seems to be a mixture of three typefaces, a Clarendon-style slab serif, a regular grot and a more formal serif. Our next stop was the North Laine conservation area, a network of narrow streets that was once home to a busy community of traditional workshops and businesses. 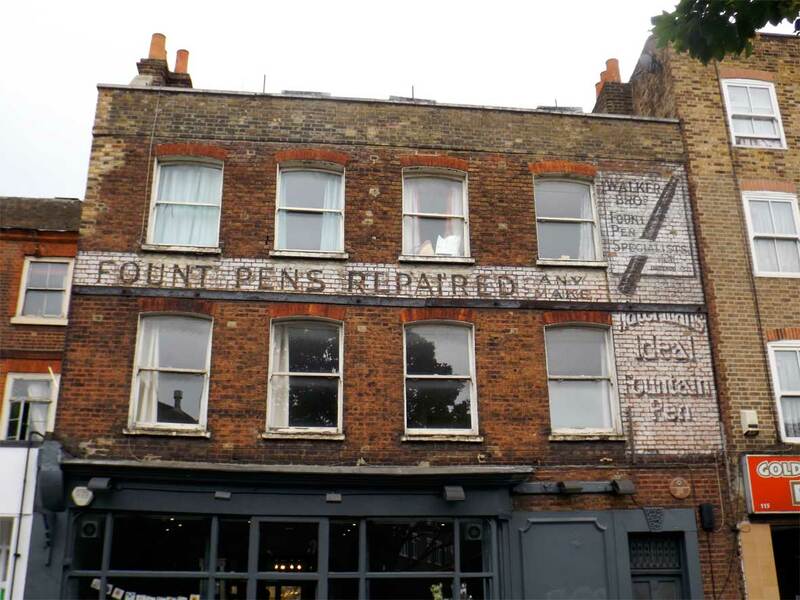 Nowadays it's packed full of antique markets, boutique shops, exotic eateries and trendy pubs, but amidst all this chaos plenty of great old type survives to tell the stories of some former inhabitants. 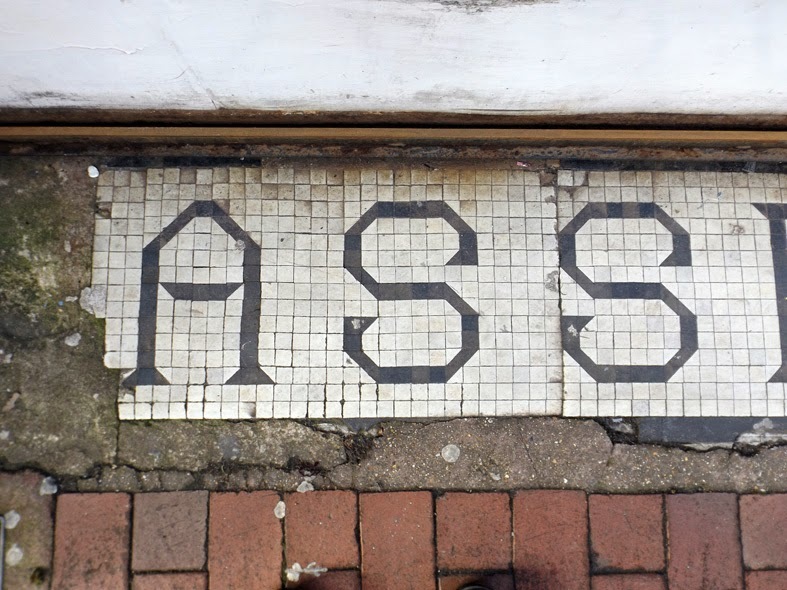 In the doorway of what is now a hairdressers this quirky mosaic marks the former home of a milliners shop. 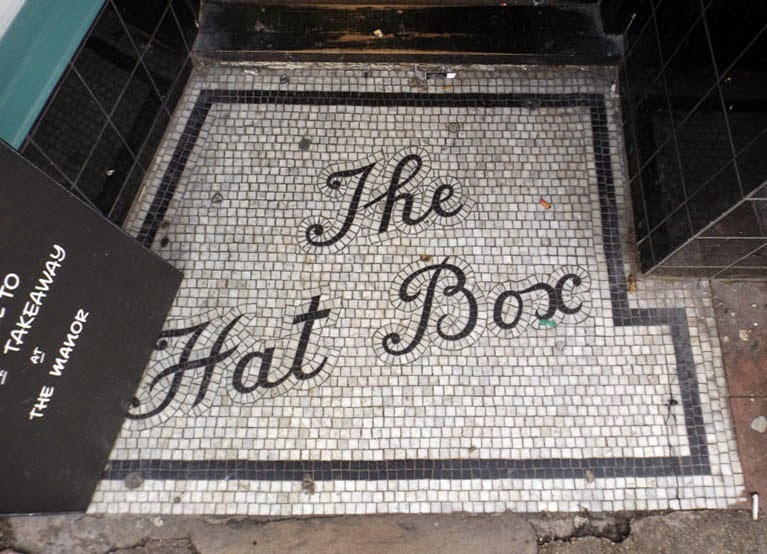 The information available on Geograph tells us that The Hat Box was in business here between 1911 and 1940. The mosaic features script lettering with extended swashes and rounded terminals on the capitals that give off an informal, friendly vibe. A great example of a preserved mosaic and the first of many to come. 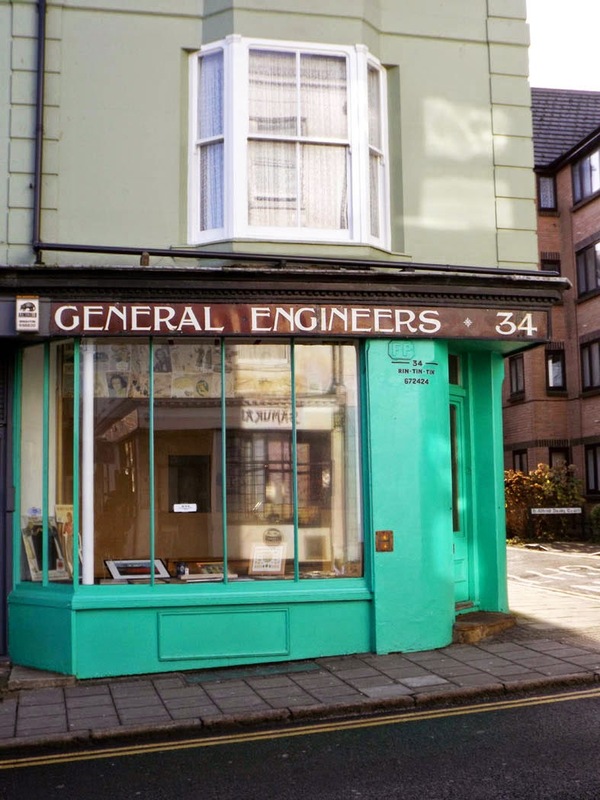 On North Road, the brightly coloured shopfront of no.34 features a brilliant hand painted sign for J.Smith, General Engineers. For the last 30 years this shop was the home of Rin Tin Tin, a antiques shop run by former graphic designer Rick Irvine which sadly closed in late 2014. 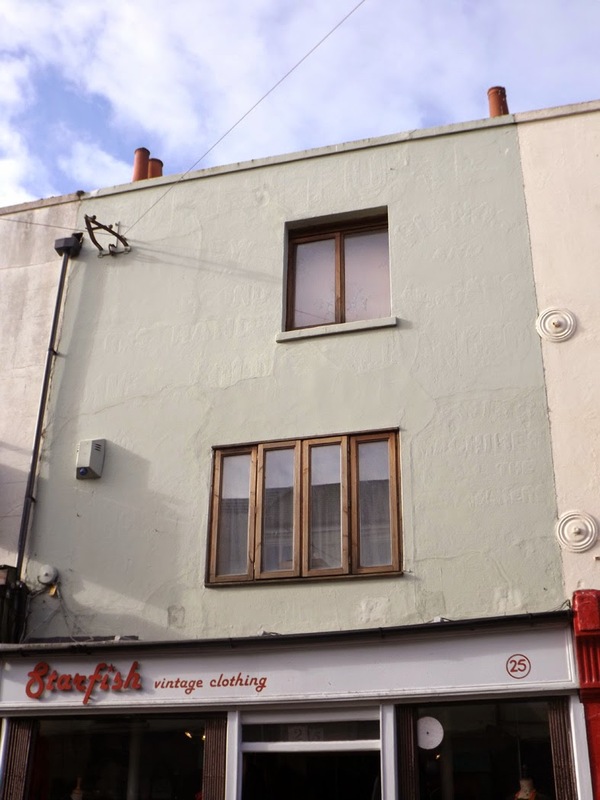 According to the Brighton Argus, Rick uncovered the sign for the previous business during some decorating work and loved it so much he decided to display it permanently. 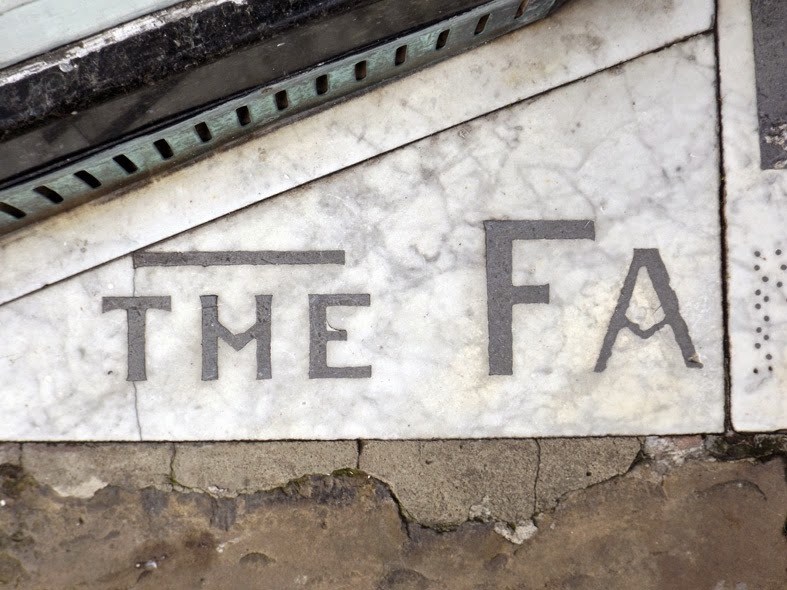 It's easy to see why this stunning sign was kept in place with its decorative Rennie Mackintosh inspired type. The double crossbar on the H, the ampersand with it's cheeky swash and the rounded terminal on the J are all great features and look fantastic against the burgundy background. 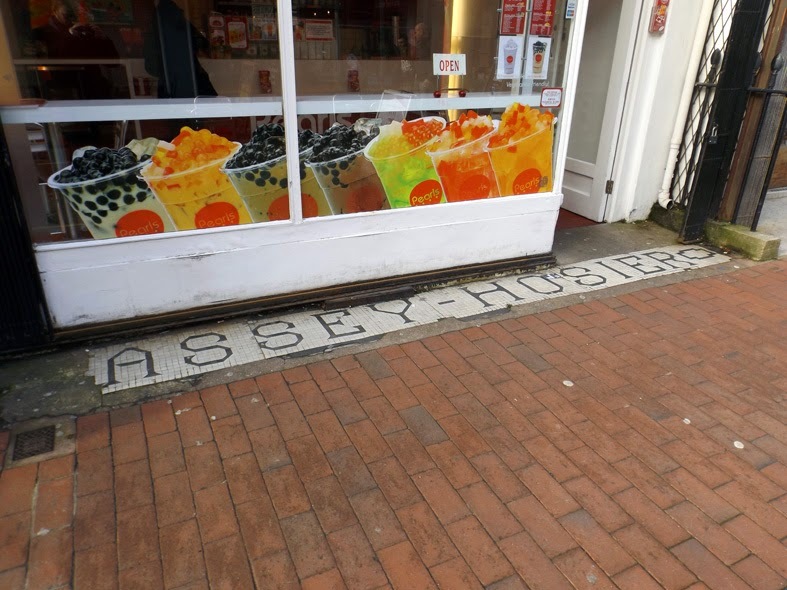 At the top of Gardner street a triangular grid mosaic for "Assey - Hosier" remains in place outside what is now a juice bar. A look at the My Brighton and Hove website reveals that the full name of the business was Cassey Hosiers, run by Herbert and Daisy Cassey from around 1905 to sometime in the 1960's. The typeface has a unique, angular character and sharp serifs. Set on a rigid square grid, it has a slight Latin feel and is certainly nothing like the mosaic type I'm used to seeing. Interestingly, graphic designer Joe Porter recently developed a full typeface from these characters called Hosier. It's an excellent piece of work and I'm sure the Cassey's would have been pleased to know their shopfront is still being admired today. 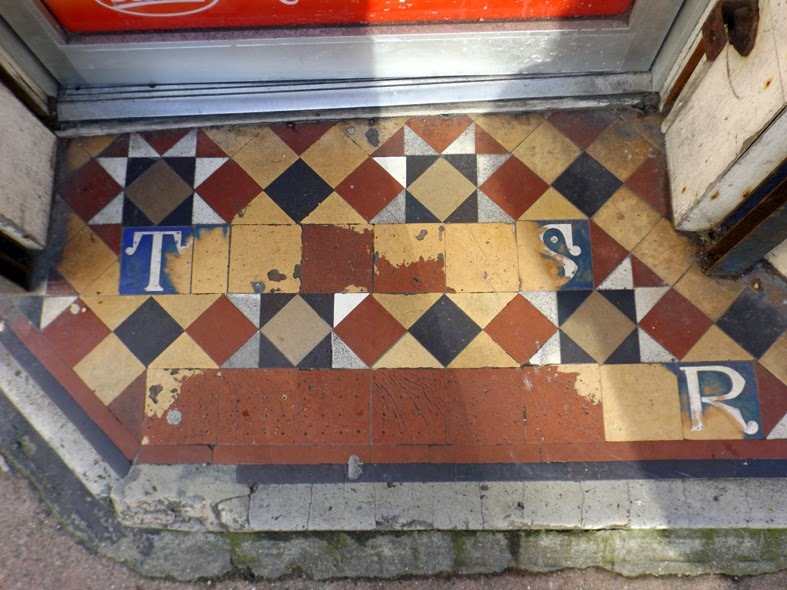 Next door to Cassey's lies another mosaic, marking the former premises of one of Brighton's oldest trading families. According to My House My Street John W Terry established a bakery here in the 1840's which survived for 20 years. 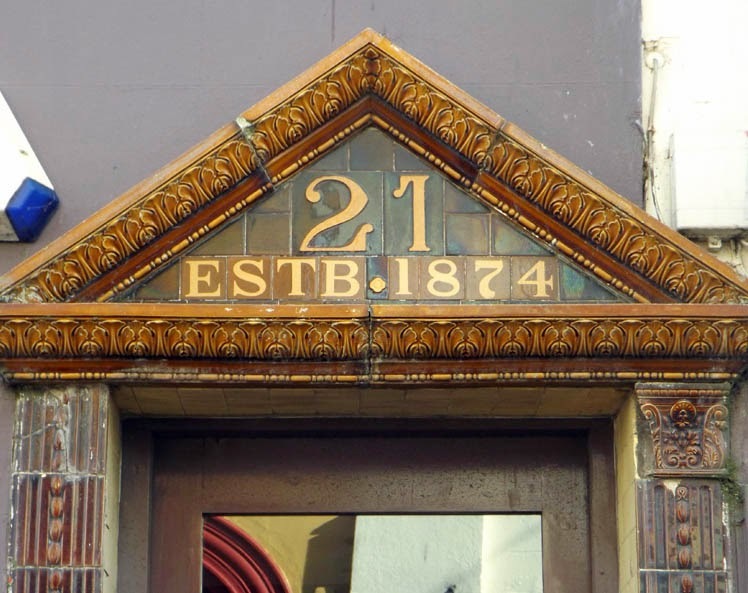 His son then founded a watchmakers that operated from 1870 all the way up until the 1980's, bringing the family's total to over 140 years on Gardner Street. Not bad! As the mosaic belonged to the watchmaking business it's safe to assume that it's at least 100 years old. 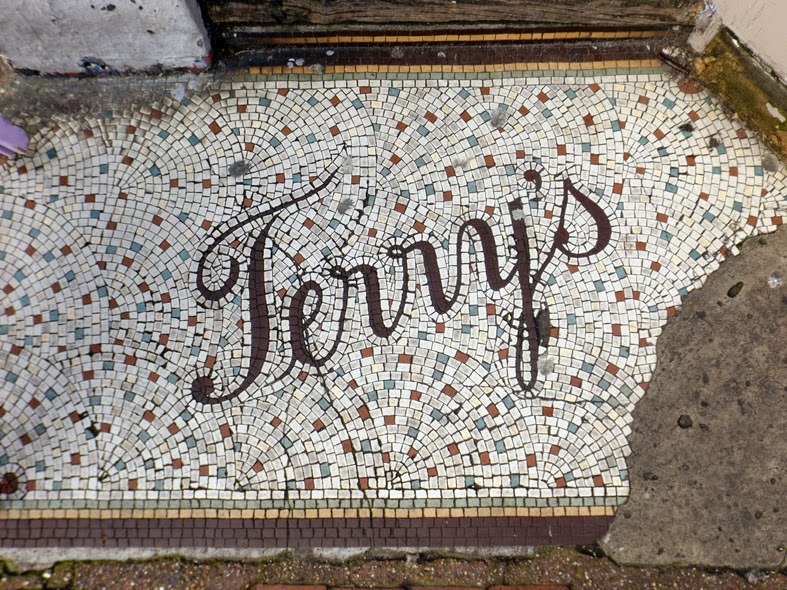 Despite this, the elegant script tiles remain in good shape and now serve as a reminder of the Terry family's legacy. 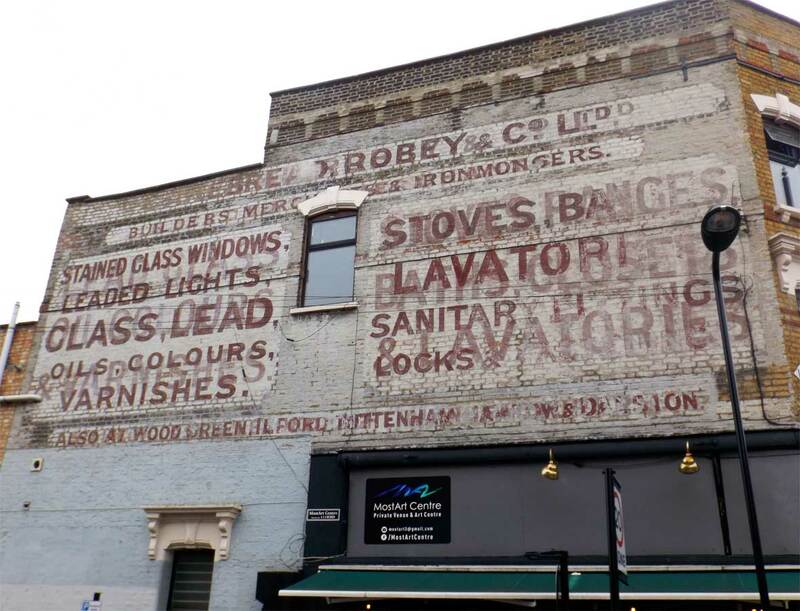 Having seen so many great pieces of preserved type so far it seems an even greater shame that further down Gardner Street, two buildings worth of painted signs have been cruelly covered with a coat of drab grey paint. If you look closely it's possible to make out lettering all over the face of the building which continues onto the next. Quite why anyone would want to cover these old painted signs is beyond me, and as such these buildings are the only black mark in what is otherwise a wonderfully preserved part of town. On nearby Bond Street, a Sass and Belle shop now resides in the former Wheat Sheaf Inn. 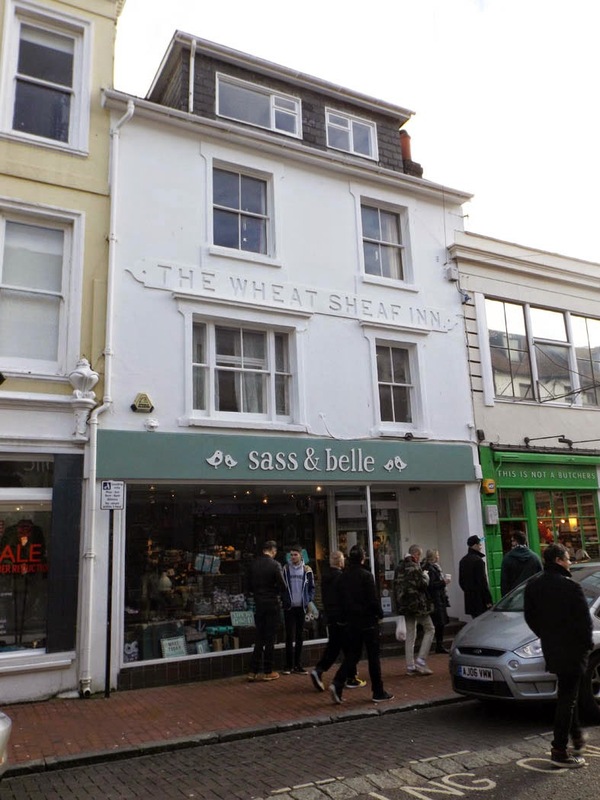 According the My Brighton and Hove, The Wheat Sheaf traded from the mid 1800's to sometime in the 1970's, though some sources state that it could have been in business as early as 1800. All that remains now is some debossed lettering on the front of building in a nicely spaced grot typeface, though at least the owners had the good sense to leave this in place. 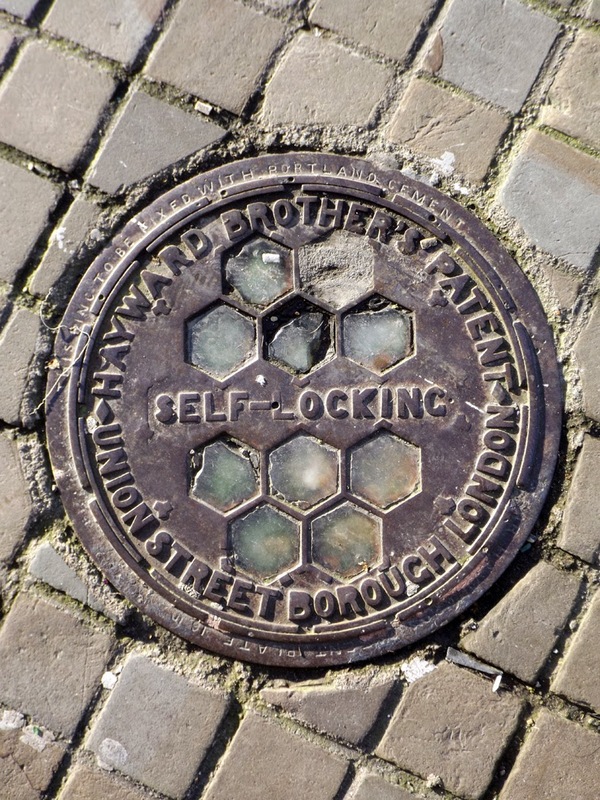 It certainly wouldn't be a good type hunt without some coal hole covers and the North Laine area has plenty. 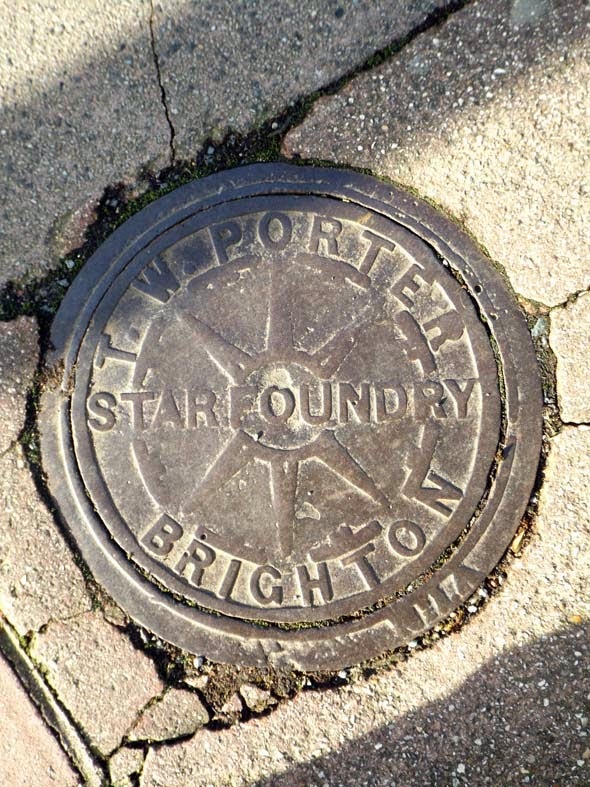 The most common is the design above, produced by T.W Porter's Star Foundry who were based in nearby Church Street until the early 1900's. There are also quite a few examples of the design below, produced by Every & Newman. Both feature fairly crude-cut grot typefaces, leading me to believe they might be a bit older than some of the more elaborate designs found elsewhere in the city. 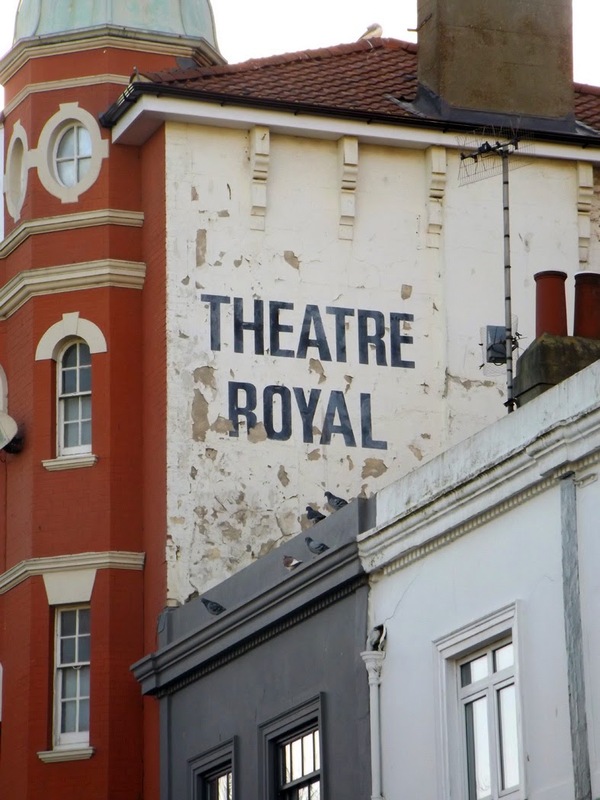 Leaving the North Laine area and heading into the centre of Brighton we passed the Theatre Royal, a grade two listed building and one of the oldest theatres in the country, being built in 1807. Although the building itself is impressive it was the peeling lettering on its side that caught my attention, a bold condensed typeface designed to be legible all the way down New Road. At this point we stopped for a much needed pint so it seems like the ideal place to finish the first part of our type hunt around Brighton. Thanks for reading and look out for part two in the next few days.